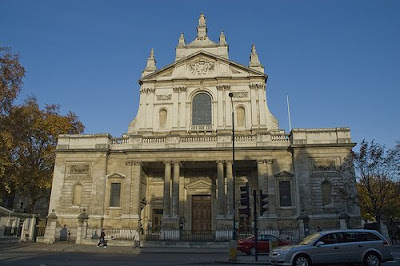 The Brompton Oratory, in South Kensington, (real name Church of the Immaculate Heart of Mary) is London's second largest Roman Catholic church. Designed by Herbert Gribble, in a competition in 1876, work began in 1880 and the new church was finally completed in 1895. From a atheist's touristing point of view, Catholic Churches have many benefits as destinations. They never underwent the iconoclasm that protestant churches did, and the Catholic Church has maintained it's immense wealth so they'er still free to enter. Owing to its size and position, the Oratory has played host to a few famous occasions over the years including the marriages of Edward Elgar and Alfred Hitchcock (not to each other).